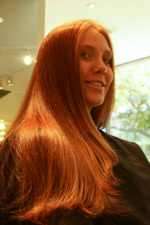 Organic Keratin treatment just $199!! Color retouch with deep conditioning $45!!!! Salon 599 is located in beautiful Norwood, Massachusetts. We have the best professional hair stylists/ colorists and rated organic professional hair care products available to Norwood and neighborhood towns with exceptional services to exceed the most demanding standards! At Salon 599, your experience will be exhilarating, with modern day technology and techniques, infused with a traditional salon experience. Come see why we are the most well-known hair salon in Norwood. At Salon 599, You will find Best eyebrow shaping with no pain. Threading is Unlike tweezing, where single hairs are pulled out one at a time.Threading can remove short rows of hair. Advantages cited for eyebrow threading, as opposed to eyebrow waxing, are that it provides more precise control in shaping eyebrows and is gentler on the skin. You'll love our comfortable location right at the center of Norwood town - we've created a relaxing and mellow environment just for you. Take your mind off the stresses of life and treat yourself to a pleasant and calming experience.